The purge of North Korea's second in command sent shock waves around the world. One writer looks at the impact on bilateral ties while the other details how the noose had tightened on Jang Song Thaek. at a cemetery for Korean War veterans in Pyongyang in July. Beijing's displeasure is expressed through the publication of a detailed account of Jang's brutal execution in Wen Wei Po, its official mouthpiece, in Hong Kong, on Dec 12. According to the report, unlike previous executions of political prisoners which were carried out by firing squads with machine guns, Jang was stripped naked and thrown into a cage, along with his five closest aides. Then 120 hounds, starved for three days, were allowed to prey on them until they were completely eaten up. This is called "quan jue", or execution by dogs. The report said the entire process lasted for an hour, with Mr Kim Jong Un, the supreme leader in North Korea, supervising it along with 300 senior officials.The horrifying report vividly depicted the brutality of the young North Korean leader. The fact that it appeared in a Beijing- controlled newspaper showed that China no longer cares about its relations with the Kim regime.Two days later, the Global Times, associated with the People's Daily, a Chinese Communist Party organ, followed up with a sternly worded editorial saying that the abrupt political change epitomised the backwardness of the North Korean political system. It warned the Chinese government not to coddle North Korea any longer, saying that the majority of Chinese were extremely disgusted with the Kim regime.The incendiary story, plus the stern editorial, provided a measure of the extent of Beijing's loathing, which is quite understandable. In purging a top official known for his close ties with Beijing in such a brutal manner, Pyongyang did not hide its antagonism towards China. The official litany of Jang's treason implicated China three times. Jang was accused of underselling coal and other natural resources for which China was virtually the sole customer. He was also charged with "selling off the land of Rason economic and trade zone to a foreign country for a period of five decades under the pretext of paying debts". Finally, he was accused of selling precious metals, thus disrupting the country's financial stability. In fact, China purchased some of North Korea's gold reserves several months ago. He was also accused of aiding Chinese businessmen in securing low prices for North Korean goods and commodities. The purge of Jang reflected the longstanding suspicion and apprehension of the North Korean regime towards China, which dates back to the time of Kim Il Sung, North Korea's founder. Although China fought the Korean War to preserve the Kim regime, he was less than grateful. Once the war was over, Kim started purging the Yan-an faction within his party. This faction received its training in Yan-an, the capital of the Chinese Communist Party in the 1940s. Stanford University research fellow David Straub recalled that when he accompanied former United States assistant secretary of state James Kelly to North Korea in 2002, the North's then Vice-Foreign Minister Kang Sok Ju made comments that minimised Chinese assistance during the Korean War. When the son, Kim Jong Il, took over the helm, he did not hide the fact that his nuclear weapons could be used against China. Dr Xue Litai, a research fellow at Stanford University's Centre for International Security and Cooperation at the time, disclosed that he received further confirmation from an American source who accompanied former US president Bill Clinton in his visit to Pyongyang in 2009. According to the source, a North Korean senior official told Mr Clinton that their nuclear weapons could not reach the US but could be "pointed West" in the direction of the Chinese mainland. The North Korean official also reportedly suggested that if the US changed its policy towards Pyongyang, the latter could become a strong bastion against China. The Korean peninsula was a vassal state of China in the 17th century. A deep-rooted suspicion remains among the North Korean leadership that China wants to make North Korea its satellite state. 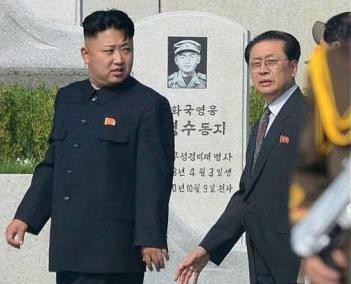 Pyongyang also resents Beijing establishing ties with Seoul, which it sees as an act of betrayal. Nuclear-armed China is seen as having double standards when it exerts pressure on Pyongyang to halt the latter's nuclear programme. So when the grandson, Mr Kim Jong Un, took over the helm, this family tradition of suspecting China prompted the young leader to take drastic action to cleanse the party of any pro-China elements. Recent developments have posed a number of issues for China. First, China's own security is at risk. The erratic and ruthless behaviour of Mr Kim Jong Un suggests that China should not underrate the likelihood of a nuclear threat from Pyongyang. The Internet version of the Global Times carried an article last Monday by Lieutenant-General Wang Hongguang, former deputy commander of Nanjing Greater Military Region, saying that the recent incident showed North Korea had become increasingly provocative and was getting out of (Chinese) control. He urged a complete reassessment of security threats originating from that direction. Second, China's political and strategic influence on the Korean peninsula has been drastically reduced. China was widely considered to be able to rein in the unruly Kim regime, thus acting as a force for peace in the region. But it now appears China's influence over its neighbour is close to zero. This is clear from the fact that Chinese Foreign Minister Wang Yi telephoned his Russian counterpart Sergei Lavrov for urgent consultation on Dec 13. This was followed by Ambassador Wu Dawei's trip to Moscow. Both moves suggest that Beijing realises it can no longer tame the Kim regime by itself. Third, China had hoped to nurture a less belligerent neighbour by encouraging reform, open- door policies and economic development in North Korea. Jang had been working closely with China to bring about a Chinese-style transformation in his own country. With Jang brutally executed, the idea of a peaceful transformation seems unrealistic.